Ever had a really long week, and you’re all tired. Then you see something that you simply can’t believe exists, and think your fatigue must be playing tricks on you? Do you find this pleasing, Kevin? ….After the first week of second quarter up here at college, this was not what i needed. So… now Sugarland is taking their inspiration from Christina Aguilera’s “Candyman” video? Great. And does this mean that Kristian Bush is officially a diva? No part of that makes sense, and it can’t just be because it’s been a long week. Wow. Not sure what the problem is, aside from the awkwardness of Kristian Bush being included on a “divas” show — which I believe Elton John once did as well??? Razor X, I believe the problem is the exact opposite: this nearly solidifies Bush’s lack of presence in the duo’s act as well as public consciousness. Aside from songwriting credits and annual award show acceptance speeches, his perceived contributions are almost nonexistent, as if he’s simply backup to Jennifer Nettles’ one-woman show. Heck, even his musical additions to Sugarland’s work is indistinguishable from the other musicians’ on the album. Moreover, yes, Elton John was an honorary ‘diva’ on Divas ’99. …the gods must love jennifer nettles and… pin-ups. “So… now Sugarland is taking their inspiration from Christina Aguilera’s “Candyman” video? Great. It looks to me like they’re being inspired (for the marketing of this one show only) by WWII, which doesn’t seem out of place for this particular show. I don’t find this USO show poster bewildering or ridiculous in any way. Good comment by OH. hahahahaha, Sugarland never ceases to surprise me, that’s for sure. It’s also not that different from what Dolly did for her For God and Country album cover. And I’ll take this over steampunk any day. Dolly’s cover was a bit ridiculous, too. Well said Stephanie. That was my intial reaction when I saw this photo as well. I don’t see an issue with the photo itself, but the fact that the label has primped this apperance as a solo appearance by Jenifer, as opposed to including Kristan, who is supposed to be her equal, according to her comments. If she wants the public to believe her& Kristian are equal partners who are always going to work together, why is she making so many solo apperances? First was the VH1 promo shot, then her apperance on the Nate Burkes Show, and her solo gig as host of CMA Country Christmas. I don’t see a problem with having her appear solo once in awhile, but the label has been doing it so much it appears intentional to shove Kristian out of the picture. …the layout style of this advert is a reference to the style popular during the wwII period. male pin-ups were not all the rage then and political correctness and equal opportunities not hot topics, either. then again, it just might be the case that kristian bush didn’t fancy the idea of posing in an open shirt. Hmmmm… I guess I didn’t even give the ad a second glance when I first saw it so it must not have struck me as that odd or noteworthy. 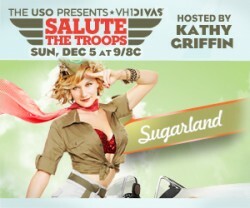 It’s not too provocative, fits with the campaign VH1 is running and I’m used to seeing Jennifer Nettles as the face of Sugarland. Oh, I think it’s cute. I love when stars do silly things like that. As long as they don’t take the Katy Perry route where that’s basically the only side of them you see. Jennifer has always been the star of Sugarland, so it doesn’t surprise me that she’s doing stuff on her own. I’m sure Kristian has a big hand in their creative process, but he just works better as a sideman. It’s just silly and over the top to see country stars dressed up in WWII costumes, so I see it as ridiculous. I’m not being derogatory. I like a lot of ridiculous things. I don’t see an issue with the photo itself, but the fact that the label has primped this apperance as a solo appearance by Jenifer, as opposed to including Kristan, who is supposed to be her equal, according to her comments. I doubt that the label has any say in how VH1 markets its program. I agree it’s sort of strange for Kristian Bush to be on the Divas stage, which he was earlier tonight btw. Nettles could have easily been billed solo, as she was as host for the CMA Country Christmas show. Jennifer Nettles is nearly indistinguishable in that photo to me. Looks a lot like Christina Applegate.